New Release from Anne Cleeland. I loved her first book of this series. Here’s the second, newly released! While I’m off on the last stop of my blog tour at Karen’s Killer Fixen’s. 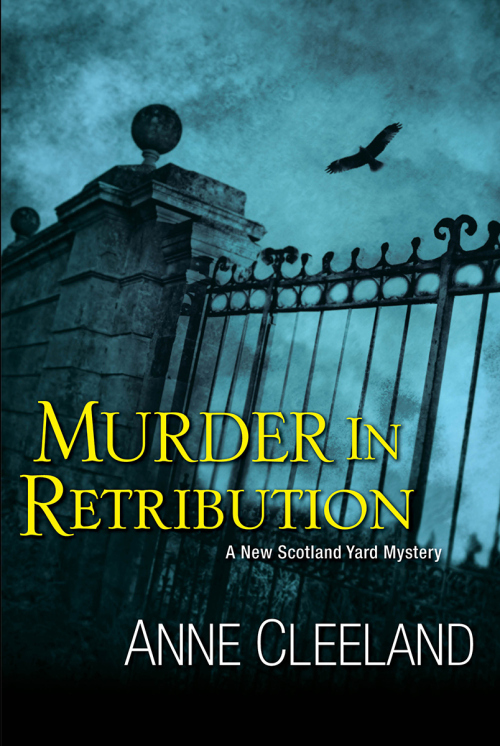 , Ann is going to introduce you to her latest release, Murder In Retribution! The second installment of Anne Cleeland’s Acton & Doyle Scotland Yard series. The two detectives are investigating an escalating turf war between two underworld factions. Ann is giving away one print copy to a commenter who tells her you want the book! Perhaps there’s nothing more to the murders than under-the-table business dealings gone wrong, but Doyle is uneasy because there’s something here that doesn’t make sense. . .and sometimes vengeance takes a wrong turn. 1 Response to Spotlight on Ann Cleeland!! I wouldn’t mind a copy but i might have to read the first unless this wouldn’t be a problem stepping into the sequel.